It’s been almost two months now since my wife and I got hitched, and I wanted to share some of the assets that we put together for the big day, as well as the invitations, thank you cards and more goodies! Our theme was vintage travel, so we had a ton of fun creating a narrative around elements that would feel at home in the 50s and 60s. 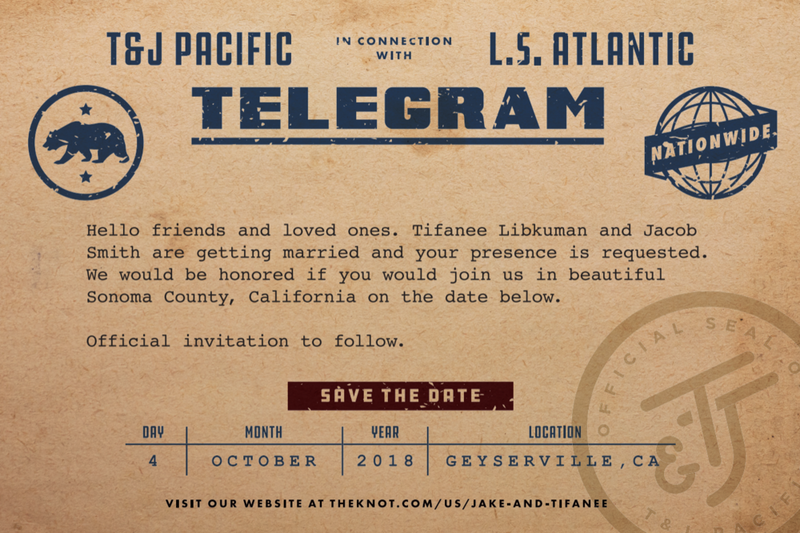 Our “save the date” was a vintage telegram. We used the monogram we created to act as an “official” seal as well. 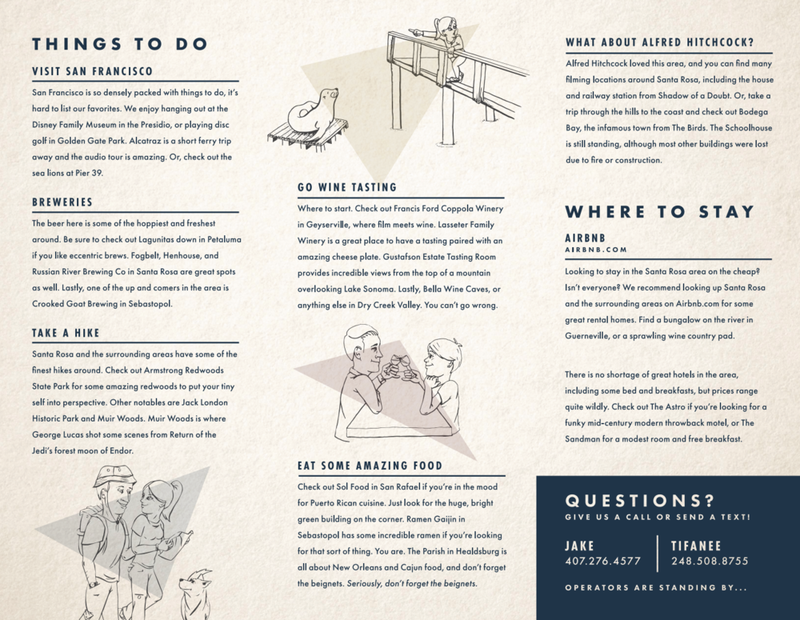 The interior of the brochure. More super fun illustrations, suggestions and tips, etc. Everyone we invited to the wedding was coming in from out of town, so we figured we could really have some fun with the suggestions, and it would actually be a practical tool for folks coming out. This was the sign in front of our wedding venue. My wife created the illustration of the two of us dancing, and we wanted to make the rest of the sign feel like it was something you’d see as you entered a little town. These were our “thank you” cards. Inspired by vintage travel postcards. The image on the front is the view from Glacier Point in Yosemite. I actually proposed at the top of Nevada Fall, pictured in the lower right corner. A little taste of everything all put together! We got a shirt printed! A little while back, the horror community was rocked to the core with the news of George Romero's passing. Romero was and will always be the father of the modern day zombie, and I owe his films for the love of the genre that I hold today. I'll never forget the first time I watched Day of the Dead on some premium movie channel way back when, late at night, summer vacation. Once that NC-17 rating flashed on the screen I knew it wasn't going to be just another movie. Needless to say, after seeing the visceral images on our tube tv, I was never the same. Flash forward a few years and I finally saw Dawn of the Dead with a friend, and realized that zombie movies, and horror movies in general could be pretty scathing satires of our modern day world. I think that movie pushed me over the edge and so I pursued more and more movies in the zombie genre. To pay homage to the late George Romero, I created a thick-lines tribute to the man's iconic 1978 film Dawn of the Dead. As some friends stroked my ego by saying they would buy a shirt with my design on it, I decided to test my skills, and posted the design to Cotton Bureau for ordering. 30-some-odd patrons later, we got a shirt printed with my design on it. Be sure to check out www.cottonbureau.com for some pretty amazing shirts by some amazing designers. I'm pretty proud to be a part of the hall of fame. About a month has passed since I proposed to my fiance, and now we're gearing up to get serious about this whole wedding planning thing. Picking dates, venues, picking the bridal party, and the list goes on. One of the things I wanted to set out to do, is create a simple monogram treatment for our big day, something we could incorporate into our wedding "branding." Tonight, I took my first crack at the mark, and I think I actually came up with something pretty interesting. I even came up with a snippet of a color palette, although that's something that's bound to change as the months go by. Daily UI day 2 was a checkout screen. Seeing as the day this was finished was the day that Marty McFly went back to the future, I figured I'd make a nice little screen for some new kicks. I've been taking part in the Daily UI challenge, and this was my first concept that I finished. Just a basic Signup form, nothing fancy, nice and minimal. Design goodies. Dogs. Movies. Musings. The Metal.